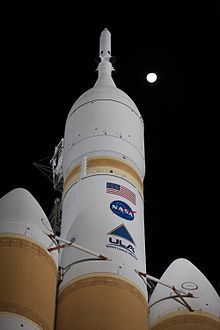 ^ "ESA workhorse to power NASA's Orion spacecraft / Research / Human Spaceflight / Our Activities / ESA". Esa.int. January 16, 2013. Retrieved July 15, 2014. ^ "Orion Post-Scrub News Conference". December 5, 2014. ^ Berger, Eric (July 28, 2016). "A new, independent review of the Orion spacecraft is pretty damning". Ars Technica. Retrieved July 28, 2016. ^ Fountain, Henry (December 5, 2014). "NASA's Orion Spacecraft Splashes Down in Pacific After Test Flight". The New York Times. Retrieved December 5, 2014. ^ a b Foust, Jeff (March 27, 2015). "NASA's Choice for Asteroid Redirect Mission May Not Sway Skeptics". Space News. Washington DC. Retrieved March 28, 2015. ^ Gates, Michele (July 28, 2015). "Asteroid Redirect Mission Update" (PDF). NASA. Retrieved September 6, 2015. ^ "US and Europe plan new spaceship". BBC News. May 5, 2011. Archived from the original on May 6, 2011. Retrieved May 14, 2011. ^ "ATV evolution studies look at exploration, debris removal". Spaceflight Now. June 21, 2012. Retrieved June 23, 2012. ^ Bergin, Chris (November 21, 2012). "UK steps up, as ESA commit to ATV Service Module on NASA's Orion". NASASpaceFlight.com. Retrieved July 15, 2014. ^ "Multi Purpose Crew Vehicle – European Service Module for NASA's Orion programme". Airbus Defense and Space. Retrieved March 7, 2016. ^ Cody Zoller (December 1, 2015). "NASA to begin testing Orion's European Service Module". NASA SpaceFlight. Retrieved March 7, 2016. ^ Mika McKinnon (mika.mckinnon@gmail.com) (December 4, 2014). "Meet Orion, NASA's New Deep Space Explorer". Space.io9.com. Retrieved October 31, 2016. ^ "Launch Abort System Jettison Motor | Aerojet Rocketdyne". Rocket.com. Retrieved October 31, 2016. ^ "NASA Extreme Makeover—Space Vehicle Mockup Facility". 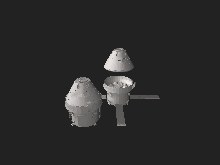 nasa.gov. Retrieved December 5, 2014. ^ "What Goes Up Must Come Down As Orion Crew Vehicle Development Continues". Space-travel.com. Retrieved July 15, 2014. ^ "Orion Continues to Make a Splash". Space-travel.com. Retrieved July 15, 2014. ^ "Orion Drop Test – Jan. 06, 2012". Space-travel.com. Retrieved July 15, 2014. ^ Bergin, Chris (November 6, 2011). "NASA managers approve EFT-1 flight as Orion pushes for orbital debut". NASASpaceFlight.com. Retrieved July 15, 2014. ^ a b Bergin, Chris (October 17, 2011). 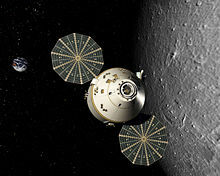 "Space-bound Orion taking shape – "Lunar Surface First" missions referenced". NASASpaceFlight.com. Retrieved July 15, 2014. ^ "NASA Conducts Orion Parachute Testing for Orbital Test Flight". Space-travel.com. Retrieved July 15, 2014. ^ Bergin, Chris (February 10, 2012). "Orion hoping for success with second generation parachute system". NASASpaceFlight.com. Retrieved July 15, 2014. ^ Bergin, Chris (February 26, 2012). "Orion PTV preparing for drop test on Wednesday – EFT-1 Orion progress". NASASpaceFlight.com. Retrieved July 15, 2014. ^ "NASA Conducts New Parachute Test for Orion". Space-travel.com. Retrieved July 15, 2014. ^ "Orion parachutes preparing for another milestone drop test on April 17 | NASASpaceFlight.com". www.nasaspaceflight.com. Retrieved August 26, 2015. 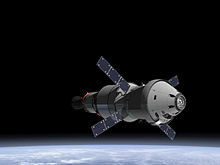 ^ "Year to abort: NASA preps Orion capsule for 2019 Ascent Abort-2 test". April 27, 2018. Retrieved July 23, 2018. ^ Messier, Doug (February 11, 2014). 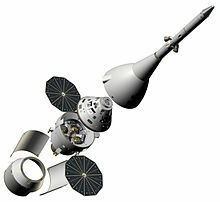 "ATK to Upgrade Space Florida's Launch Complex 46". Parabolic Arc. Retrieved February 12, 2014. ^ "NASA & US Navy Test Demonstrates Water Recovery of Orion Crew Capsule". Universetoday.com. Retrieved July 15, 2014. ^ Jackson, Shanessa (September 11, 2018). "Competition Seeks University Concepts for Gateway and Deep Space Exploration Capabilities". nasa.gov. NASA. Retrieved September 19, 2018. ^ a b Clark, Stephen (November 20, 2017). "NASA expects first Space Launch System flight to slip into 2020". Spaceflight Now. Retrieved May 24, 2018. ^ "NASA Completes Key Review of World's Most Powerful Rocket in Support". NASA. Retrieved October 26, 2015.